At York University, where I work, not a single full-time faculty member wants there to be a work stoppage. I presume neither does the employer. Lord knows the University has had enough negative labour relations in the news lately. While there is a very sad labour relations history involving the University and part-time instructors representing by CUPE, work stoppages involving the full time faculty represented by YUFA have thankfully been rare. Of course, there is very little chance that the current government in Ontario will permit a work stoppage at York University, or any other educational institution. The Premier has already made clear that he gives little weight to the Charter of Rights and Freedoms. If he is prepared to use the s. 33 notwithstanding clause to override the Charter in order to implement a personal pet project, he will almost certainly take pleasure in showing his base how he will use that clause to override fundamental rights and freedoms afforded public sector unions and unionized workers under the Charter, including the right to collective bargaining and to strike. Frankly, it is difficult to imagine another legal work stoppage in the public sector, at least one that lasts more than a day or so, while this government resides at Queens Park, unless the work stoppage benefits the Conservative Party in some manner. YUFA’s collective agreement expired in May and bargaining has slugged along. I’m not in the room, so I can’t speak with authority on the mood of bargaining. This week, YUFA intends to hold a membership meeting to discuss holding a strike vote. Some faculty members have argued that YUFA should not hold a strike vote at all, or that if a strike vote is held, faculty should vote against a strike. I presume the logic behind this would be to “demonstrate to the public” that faculty have no intention to strike and to ensure that no strike in fact occurs. While perhaps a noble idea, that position demonstrates a lack of understanding of how the Canadian industrial relations and labour law model is supposed to work. Here’s why. 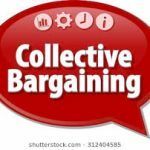 Almost always, about 95% or more of the time, collective bargaining ends without a work stoppage. However, sometimes bargaining reaches an impasse and, as I explain in Chapter 42 of my book The Law of Work, the law provides two options for resolving them. The first option is for the parties to agree to refer the outstanding matters to an interest arbitrator who hears submissions from the parties and then effectively writes the collective agreement (Section 40, OLRA) While voluntary interest arbitration is always available, it is used relatively infrequently for the simple reason that one party or the other usually believes that an arbitrated collective agreement is not in their interest and both parties need to agree to it. Which York University argument is correct? This is why you should roll your eyes whenever a party to a collective agreement attempts to demonize the other for not agreeing to interest arbitration. Whether a party supports or does not support interest arbitration at any moment in time depends entirely on whether that party believes an arbitrated collective agreement suits their interests. That can change depending on the circumstances. The second option for resolving bargaining disputes we can call the “economic warfare” route. For this option, the law gives each party weapons to apply bargaining pressure. The union/employees are given the right to engage in complete or partial strikes. A complete strike means stopping work and usually standing out front of the workplace in a picket line. A partial strike can take a variety of forms. It can mean that some workers strike some times, or that all workers strike but only for a day or sporadically. It can also mean a work to rule, in which the workers perform some of their jobs but not other parts of their job. For example, at a university, it could mean that faculty teach all or some of their classes, but stop performing any administrative functions. The obvious objective of a strike is to put pressure on the employer to return to the table and improve the package. The law also gives the employer some weapons to pressure the union/employees. One is a lockout. A lockout involves the employer refusing to permit its employees to work. That is what is happening right now at the CNE and at D-J Composites in Gander, where a lockout has continued for almost 2 years! The other weapon the law gives the employer is the right to unilaterally implement terms and conditions of employment against the wishes of the union. And this weapon, while less known, is crucial to understanding why unionized workers should always vote to strike even when they do not want to actually strike. Employers in the public sector have shown an increased interest in using this weapon in recent years, including university employers. In Ontario, workers cannot legally strike unless the union has conducted a successful strike vote (Section 79(3), OLRA). This means that the legal weapons given to unions/employees to pressure employers in bargaining, including complete and partial strikes, are not available for use until a successful strike vote is held. It’s like giving a police force guns without ammunition. In order for the union/employees to have any ammunition to respond to an aggressive employer, they need a successful strike vote in their back pocket. Just like it would be ludicrous to send a police force into a battle without ammunition, it is a staggeringly stupid strategic move for workers to go into a legal strike/lockout period without activating the very weapons that the law gives them in our collective bargaining model in order to create a more balanced bargaining environment. The employer’s weapons come already locked and loaded. For example, the law does not require an employer to obtain shareholder approval or consent from a majority of a board of directors (or Senate in the case of a university). In most cases, unions have no problem passing a successful strike vote, with a large majority voting to strike. That is because most people understand that a strong strike vote arms the bargaining committee with a powerful tool to return to the table. Successful strike votes are a precondition to a lawful strike in Ontario, but unions that have taken successful strike votes rarely actually strike. Simply knowing that the union could strike is enough to make most employers take bargaining seriously. However, we have seen unions make the mistake of not taking a strike vote, either because they wanted to demonstrate that they do not want a strike and/or because they were uncertain of the outcome of the vote. This leaves the unions weaponless and vulnerable to the employer’s weapons. When the legal strike/lockout date came, the City announced that it would not lockout workers, but instead it would simply impose the terms of employment that it had last provided to the union. These terms included changes to the rules restricting contracting out of jobs, so that City could fire garbage collectors and give their jobs to a private sector provider, as Rob Ford had promised. The Union had resisted these changes, trying to save their members’ jobs. But the employer had been clever. The union had proposed to simply roll over the previous collective agreement and take a 0% wage increase. The city said no, we insist on giving workers who we don’t fire a raise. So you had the odd scenario where the union offered a wage freeze and the employer wanted to give a raise. Why? Because the city wanted at least 51% of the membership to accept a new collective agreement giving the employer what it wanted: the ability to contract out jobs. Therefore, the terms the employer threatened to unilaterally impose included a good enough raise that it hoped would entice enough workers to vote in their own personal interest and sacrifice the more junior employees who would lose their jobs due to the new more employer friendly contracting out language. This divide and conquer strategy is aided remarkably by the legal right of employers to unilaterally impose collective agreement terms. While an employer usually wants wide spread employee support for a collective agreement for morale and other HR reasons, it does not legally require it. It can try to push through controversial, divisive contract changes if it wants. If it wants a new collective agreement, it just needs 51% of the employees to accept the deal, because our law says that a collective agreement is only valid if a simple majority of employees voting in a ratification vote accept it. The problem that CUPE faced when the City threatened to impose contract terms was that it had not taken a strike vote and therefore the union and employees had no lawful weapons to resist. They were unarmed. Sure, CUPE could try to hold a strike vote at that late date, probably after the employer had already imposed the terms. The difficulty was that the employer had included enough sweeteners for enough employees that it was by no means clear that a strike vote would succeed at that point. So with no bargaining power at all, CUPE negotiated a couple of modest improvements to the employer’s final offer and the employer got what it wanted. Soon afterwards, hundreds of CUPE members lost their jobs. The University finds itself in a position where WUFA’s bargaining team has yet to acknowledge the very real fiscal situations we face, and therefore is now taking steps to draw sharper attention of the situation to all members. v) The University will cease collecting union dues from members and forwarding those dues to WUFA (Article 4:01 and 4:02). Normally, a union confronted with a threat like this could respond by striking, or by engaging in some other lesser form of industrial action to get the employer to back off. That is why the threat of unilateral imposition of contract terms is not usually a big threat. But WUFA had not taken a strike vote. It had no weapon to respond to the employer’s unilateral imposition of unfavourable contract terms. And it was the summer, so a lot of faculty were not on campus, making mobilization difficult. In August, with faculty members now understanding what the employer was wiling to do, WUFA finally got around to holding a strike vote and it was successful. The gun was now loaded. Starting in September, WUFA began a series of rotating strikes, beginning with one day strikes, following by a series of half-day strikes with 2 hours’ notice, followed by a threat of a complete strike if the employer did not return to the bargaining table. Professors could have boycotted all administrative work, or come up with other strategies to pressure the employer to return to bargaining. All of that would be legal, because the professors were in a legal strike position having now taken a strike vote. The employer returned to the table and a new deal was reached. Had WUFA taken a strike vote initially, the employer may not have threatened to impose terms at all. But the employer knew the union’s gun was not loaded, which emboldened the University to take an aggressive approach. The moral of the story is obvious. The balancing of power built into the legal model of collective bargaining depends on the union having a successful strike vote in its pocket. This do not mean a strike will happen. Obviously no union is going to call a strike unless a strong majority of the workers support a strike. If there isn’t support for a work stoppage, the work stoppage will fail. However, by failing to take a strike vote, not only are workers weakening their bargaining committee, they are handing over all of the power to the employer to do what it wants, including imposing unfavourable contract terms. Absent a successful strike vote, workers have no legal means to resist when the employer unilaterally imposes contract terms. A successful strike vote gives employees options that do not exist when no vote is taken. If York follows Windsor’s lead (and you know it has looked at it), and imposes unfavourable terms, then a successful strike vote at least gives YUFA members options to discuss and debate, including various rotating strikes and work to rule strategies, like those used eventually at Windsor to push the employer back to the table. Without a successful strike vote, workers are stuck with whatever the employer imposes, if York elects to go in that direction. A strike vote is simply the means by which a union obtains a licence to use the legal weapons the law provides it with if and when those weapons are needed. Like an officer and her gun, you hope and expect you won’t need to use the weapon, but you’d be an idiot not to load the gun before you enter into a potential conflict. The employer’s gun is loaded, and in recent years public sector employers have demonstrated a willingness to use theirs. It is the fact the union has its own loaded gun that gives employers pause and an incentive to sit down and reach a deal. This is how the legal model is designed to work, and in fact how it does work almost all of the time. Therefore, think of the strike vote as a self-defence mechanism if that helps, only to be used if the employer draws first. But you defiantly do not want to go down that alleyway without your weapon, especially not in the present industrial relations climate. Can you please explain how it is lawful for an employer to impose unilateral terms and conditions on employees after the expiration of a collective agreement? I thought this was a period of statutory freeze and that this was affirmed as an employee right in the SCC case United Food and Commercial Workers, Local 503 v. Wal‑Mart Canada Corp.? PatXYZ, once the parties are in a legal strike/lockout position both the collective agreement and the statutory freeze period have expired. That is how the law permits the employer to introduce new terms and conditions. The employees can refuse to work under those imposed terms (i.e. strike).